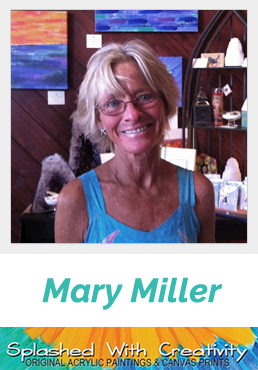 In 2012, Mary Miller opened Splashed with Creativity because of her life long love of art in Crystal Lake IL, after having taught elementary education for 20 years. She sells Canvas Art, Ceramic Tiles, Greeting Cards and more in vibrant and cheery designs. She has used her art to benefit a variety of charities over the years by designing greeting cards. "They weren’t anything "fancy" or very "professional" in the beginning, a neighbor took photos of a few of my canvases and I had prints made, then glued the prints on blank cards that I purchased at a local craft store" she recalled. The proceeds from the sales are still going to different 501(c) 3 charitable organizations. I do not have any business knowledge; I just go on gut instinct. SSS: What have been the biggest challenges you’ve faced in your store? SWC: In store, or in my case studio, the biggest challenge I continually face is actually getting people into the studio. I am constantly amazed how many people don’t even know there are actually art studios at Lakeside Legacy Arts Park! It can be missed completely; visitors do not easily spot the listing of studios. SSS: What have been your biggest successes? SWC: Getting Splashed with Creativity’s name out to the public and having my art recognized by people at various locations are by far my greatest success as to date! People tell me they saw my canvases here or there, or shop owners will tell me customers will see something of mine at their location and tell them something like, "I know that artist’s work!" That has been most rewarding! SSS: What is the long-term vision for your store? SWC: Ideally, I’d like to move my studio to a warmer climate. I am often asked where I’m from originally because my art is most often described as "bright and cheery", many people are surprised to learn I grew up in the Midwest. Using my art, I’d also like to be able to do more with charities and fundraisers both in and out of my studio. If you have a charitable cause, please give me a call. I love giving back to the community! SSS: What type of marketing works best for you? SWC: I’m not sure if this is really marketing, but what has worked best is people seeing my art in person. I’m always giving out samples like greeting cards, depicting my art. In addition to monetary tips, I give waiters and waitresses, groomers, landscapers, car wash attendants, and the like, a Splashed with Creativity greeting card, window cling, or bookmarker. Additionally, I have a newsletter that is e-mailed out. Although I’m trying my hardest, technology is a struggle for me. PLEASE Like Splashed with Creativity on Facebook! If anyone has ideas on how to increase my online sales, PLEASE let me know! SSS: What unique things do you do to keep customers happy? SWC: I love meeting people, talking with them, listening to them, answering their questions about my work and basically getting to know people better. I always enjoy learning people’s favorite colors. One of the best answers I ever got was "I like all the colors of the rainbow!" At my checkout I have a mason jar filled with decorative fillers and old paintbrushes with paint on them. I have the customers pick one and depending on the color they receive a free gift (greeting cards or bookmarks) and then they are automatically entered into a drawing for a canvas print. I think my high energy level gets people excited about art and I have found the big smile I wear tends to make others happy too! SSS: What is the most valuable lesson you’ve learned since launching your business? SWC:Like I said, I have no "formal" business knowledge so the most important thing I’ve learned is to surround yourself with people in the business world who you can learn from, are passionate about what they do and are as energetic as I am!